In the experimental set-up, a laser beam strikes a sample of fused silica glass (FS). An imaging lens (I) collects the photons emitted at 90 degrees and sends them to a spectrometer and CCD camera. Image credit: F. Belgiorno, et al. (PhysOrg.com) -- In 1974, Stephen Hawking predicted that black holes emit thermal radiation due to quantum effects, which causes the black holes to lose mass and perhaps ultimately vanish. But despite numerous attempts to observe Hawking radiation, astronomers have so far detected no sign of it. Now, however, a team of scientists from Italy claims to have observed something that looks very much like Hawking radiation from an event hole horizon they created in the lab. Franco Belgiorno at the University of Milan and his coauthors will publish their study in a future issue of Physical Review Letters, and the paper is currently available on arXiv.org. As the physicists explain in their study, the essential ingredient of Hawking radiation is not the black hole itself but rather the space-time curvature associated with the black hole's event horizon. The event horizon acts as a boundary beyond which light cannot escape. So particle pairs excited from the vacuum that form close to the black hole horizon are split so that the inner photon falls in and the outer photon escapes, gaining energy at the expense of the black hole. Event horizons are not unique to black holes; they can be exhibited in a variety of physical systems, from flowing water to a moving “refractive index perturbation” (RIP) in a dielectric medium (in which light can change the medium's refractive index). It's this latter system that Belgiorno and his colleagues used in their experiment. To create the Hawking radiation, the scientists fired ultrashort (1-picosecond) laser pulses at transparent glass, which excited an RIP that exhibited an event horizon. 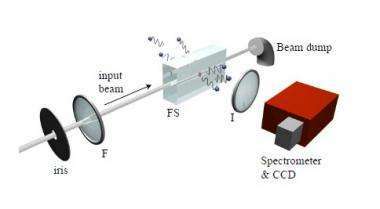 Using a CCD camera, the researchers detected a peculiar kind of photon emission at a 90-degree angle to the glass. As the researchers explained, they arranged the experiment in a way to strongly suppress or eliminate other types of radiation, such as Cerenkov-like radiation, four wave mixing, self-phase modulation, Rayleigh scattering, and fluorescence. Interestingly, the physicists note that there are actually two event horizons associated with the RIP. Besides the black hole horizon, there is also the black hole horizon's inverse called a white hole horizon. As the laser light approaches the RIP, the light experiences an increase in the local refractive index, causing it to slow down. Under appropriate conditions, the light can be brought to a standstill in the reference frame comoving with the RIP, which forms a boundary beyond which light is unable to penetrate: the white hole event horizon. In the case of the RIP, the leading edge is the analogue of the black hole horizon and the trailing edge is the analogue of the white hole horizon. More information: F. Belgiorno, et al. "Hawking radiation from ultrashort laser pulse filaments." Physical Review Letters. To be published. Available at arXiv:1009.4634v1. maybe Hawking radiation meachanism not only evaporate black holes, but could be the driving force for dark energy, evaporate/expand the universe as well, consider that CP violation mean virtual particles of and antiomatter virtual particle counterpart, might have slightly different spacetime curvatures, and consider the planck scale as our event horizon, then upon annihilation, the spacetime curvature does not return to baseline, but could be skewed more to either negative of positive! Since the universe is expanding (uncurling, uncurving if you like) at an accellerated rate i would theorize that antimatter is slightly stronger curved. The energyflah of the small annihilation dillutes itselve in the Dirac sea of virtual particles in the piece of newly unfolded spacetimke, and there it will adds increase the zeropoint energy, accellerating the frequency of particle/antiparticle creation ---> ultimately leading to uncurling of spacetime at an accellerated rate. I don't think this is going to be seen as analogus to a BH event horizon. This experiment appears to be more akin to a dark matter blob than a singularity of energy. I'd await correlation from other teams or proper definition of the experiment before I jump in on either front. Wow, this experiment has already been included in wikipedia. I recommend the article for all of you who haven been asking. "Under experimentally achievable conditions for gravitational systems this effect is too small to be observed directly. However, a recent experiemental set-up created a laboratory "white hole event horizon" that the experimenters claimed was shown to radiate Hawking radiation. Some scientists predict that Hawking radiation could be studied by analogy using sonic black holes, in which sound perturbations are analogous to light in a gravitational black hole and the flow of an approximately perfect fluid is analogous to gravity." All it shows is that the same mathematics governs different processes. Photons don't have antiparticles and analogous to gravity ain't gravity. Other than that the experimenters observed Hawking Radiation for sure. Hawking radiation is a product of his mind that speculates something called his radiation. mathematics is many a times to abstract to depict the physical reality. In fact we as scientists are reflecting our own mind. What you think, it becomes so. Thus consciousness becomes the source of what we call scientific reality. The entire creation of the universe(s) is a product of expanding human mind. Related is the stuff Bill Unruh has done recently on mimicking the effects of Hawking radiation in water waves. It's logical, because vacuum is behaving analogously to water surface in most of situations. After all, this is why dense aether theory was introduced. It's funny to observe, how laymans are fighting against water surface models here - whereas mainstream scientists are using them routinely. The particle (photon, positron, etc) that crosses the event horizon is treated as a particle with negative energy, thereby reducing the mass of the black hole. Photons do not have antiparticles, virtual photon particle pairs do not exist. We can take a photon ( 1 ) and from it derive a particle pair ( +1/2,-1/2 ) but photons do not virtually spark into existence as their annihilation would never take place. Photons do not have antiparticles. "Some particles are their own antiparticles, the antiparticle of a photon is a photon for instance." It's the acceleration field of the black hole that rends these virtual photon pairs apart before they annihilate, which is the underlying mechanism behind Hawking radiation. while it is true, photons have a collective net charge of zero, they're neutral, they are not true opposites as, after all, they are one and the same. A particle such as an electron lays in the negative part of the Higgs field, it has mass. A positron lays in the positive portion of the field. Do you have sources? I’d like to see them now please. Electrons and positrons both have demonstrably positive and equal masses, yet you seem to be equating electrical polarity with positive and negative mass. ... Thus consciousness becomes the source of what we call scientific reality. The entire creation of the universe(s) is a product of expanding human mind. This is not true. Because science, as a creation of minds, cannot replace the objects it reflects on. Not only scientists, but also every human look at things in their own way. Despite various reflections upon it, the reality is one. Reflections, however many and ingenious they are, can by no means be called reality. Science is reflections of this kind that are scrutinized by reasoning. I think I know what has got you lost. Light being massless as a result of being equally in the positive and negative end of the Higgs Field ( space-time ). Light is massless because it doesn't couple with the Higgs field, and there isn't a "positive and negative end" to the Higgs field (which isn’t spacetime). I think you mean "dense aether" but you're saying "Higgs field." That's not just misleading, it's unethical and immoral. You’re deliberately misleading people who come here to understand real science. This is not due to a net mass of zero ( as in +1 g and -1 g ), light is massless due to a net charge of zero ( as in +1 ev and -1 ev ). Ridiculous - if mass required charge to exist, there'd be no massive neutral particles, but there are plenty: neutrons, pions, kaons, neutrinos, Z bosons, etc. etc. Can it serve as a sufficient argument for relevance of dense aether concept? Ot it's still just an coincidence? This is not hawking radiation, hawking radiation is the unpairing of virtual particles, this is escaping electromagnetic radiation ( photons ) from an overly infused system. Photons are virtual particles. Hawking Radiation is thermal, which would be electromagnetic in nature. You're rather incorrect. I understand the construct of Hawking radiation. You're arguing the wrong points and you're incorrect as to the mechanism by which it works. You have the majority of it right, however, an anti particle annihilation wouldn't remove energy from the blackhole. It would simply convert the mass to energy which would remain trapped in the blackhole, or would return to the space time fabric. The energy is "stolen" from the black hole through the kinetic energy that tosses the, no longer virtual, particle out into space. The electromagnetic energy is thereby stolen from the blackhole by the escaping particle. Secondly, let's say the anti particle isn't the part of the pair that falls in. Well now you're not destroying anything. Probability would show that through particle anti-particle pairing, the black hole wouldn't ever decrease in size as it would consume and equal amount of particles and antiparticles over time. That is why the kinetic energy is important. And that is how you have it wrong. Blackholes shrink as they fill with energy. Matter and energy are one in the same. Focused energy in a single point = matter, with mass, which means black holes don't "fill in". Both the negative and positive charges are energetic and cause the blackholes evaporation, even light which is neutraly charged is energetic and causes the loss of mass. You're insisting that magnetism is responsible for the evaporation of blackholes. Do you understand how totally ridiculous and unsupportable this is? So you're going to tell us that you've solved what blackholes are and how they work? Publish it and collect your Nobel prize, otherwise, your false reality is not interesting to us, Zephir. Blackholes shrink as they fill with energy. A hole in the ground being filled with dirt shrinks. Well, it does have undeniable selfevident pothole logic about it that it would pass occams razor test with flying colors. Except the explanation leading to his "theory" is based on dense aether theories. I'm pretty sure Ockham said "simplest answer" and not "most frequently falsified answer." I don't buy it. Even though they claim they "strongly suppressed or eliminated other types of radiation, such as Cerenkov-like radiation, four wave mixing, self-phase modulation, Rayleigh scattering, and fluorescence," there's plenty of room for other types of radiation. For instance, they may have seen something as simple as thermal radiation induced by the shock compression of the material. Additionally, I don't buy Hawking radiation as a viable premise. Hawking failed to account for the GP/KE of the infalling particle (from the VP pair) relative to the black hole. I think VK1 could survive being shot at while running away, because the bullet would never be able to cross the infinite half distances to reach him.